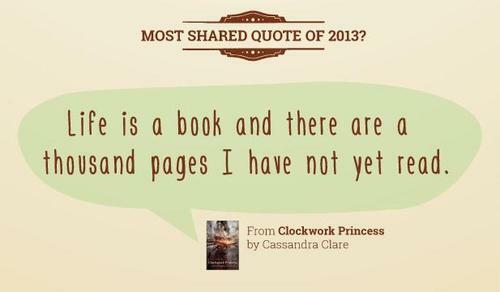 A quote from Clockwork Princess, said by Will Herondale, has been named the Most Shared Quote of 2013 on Goodreads. Congrats Cassie! I love that quote! 🙂 Congrats Cassie! Oh my goodness… I died when he said that!!! I love the quote ” I told you before that you would not leave me, and you are still with me. When I breathe, I will think of you, for without you I would have been dead years ago. When I wake up and when I sleep, when I lift my hands to defend myself and when I lie down to die, you will be with me. You say we are born and born again. I say there is a river that divides the dead and the living. What I do know is that if we are born again, I will meet you in another life, and if there is a river, you will wait on the shores for me, so that we may cross together.- Will Herondale at the old tree where he thought Jem had died. They would need better budgetting too.